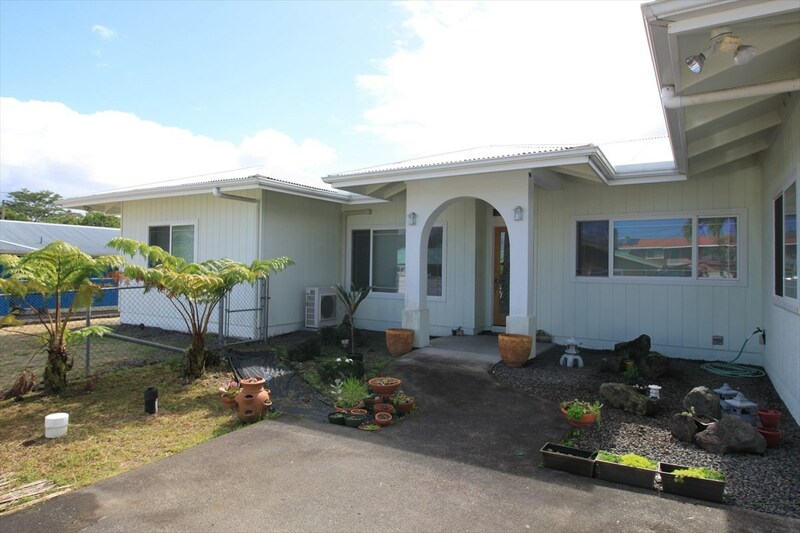 Located just minutes from Hilo's main shopping area, this custom 3 bedroom with 3 full bath home could be what you're looking for. This house has lots to offer from Fujitsu A/C to split floorpan, soffit & vaulted ceilings & pool in the backyard. With a little effort, this home could be amazing again. The entry has a custom etched glass door which brings you right into an open floor plan—perfect for entertaining. The kitchen features Corian counter tops & Moenstone sinks; one for prep and one for washing on the bar counter island. Cabinets have solid wood doors and fronts with lots of storage space. Dining room has a buffet area and the sunken living room has a vaulted ceiling and double doors which open up to the backyard. Enjoy morning coffee or pau hana time on the back lanai or while lounging by the pool. Large media room with wet bar and full bathroom is another perfect area for entertaining. Master bedroom has large bathroom and walk in closet. Interior laundry room, additional storage and carport access on one side of the house while the other side has 2 bedrooms and bathroom with hall closets. Yard is fenced with vinyl fencing, chainlink and stone walls.